Big Finish: THE INVISIBLE MAN Review | Warped Factor - Words in the Key of Geek. The War of the Worlds. The Time Machine. The Invisible Man. The First Men In The Moon. The Island of Dr Moreau. In The Days of the Comet. The Shape of Things To Come. HG Wells is one of the extraordinary phenomena of the literary world. A kind of Dickens of the emerging genre that was science fiction – and indeed, along with the likes of Jules Verne, one of the writers who helped delineate what science fiction was, separate from some science fantasy works that might fit into the category, such as Frankenstein and Dr Jekyll and Mr Hyde. He helped set the standard for which future writers would reach, like Wyndham, Herbert, Heinlein, and even Asimov. He’s by no means a lone light in the darkness in terms of the first waves of science fiction, but you’re going to have to go quite far out of your way to describe HG Wells as anything less than one of the pre-eminent masters of the genre. His redelivery to the world by Big Finish always felt like an inevitability, although what becomes clear in the interviews attached to The Invisible Man is that the original idea was merely to dramatize what is probably Wells’ best-known work, The War of the Worlds. To do so would have been to make a one-hit wonder of a writer far better than that. Wells had a scientific curiosity that expanded in many directions, and an uncanny ability to spin his curiosities – with, to be fair, a good deal of pseudoscience overgloss and gobbledegook – into stories that balanced the dreams of what might be possible with a very keen appreciation of humanity in both its highest and more particularly its lowest state. Even among his collected works though, The Invisible Man has always been a challenging conceit. It’s challenging because Wells makes the central character of the story, the eponymous Invisible Man, more or less thoroughly unlikeable. This is not a factor of the various portrayals the character has had over the years, it’s baked right into the fundamental conceit of the character – Griffin, the man who becomes invisible, is described as particularly ugly, but he has an eye for young women that makes him feel inherently predatory. He’s a man who has been both comically and tragically overlooked in his lifetime. He’s forced to eke out a living as a teacher, despite burning with the potential for scientific genius. He has the ego of a titan, but, before he becomes the Invisible Man, goes largely unrecognised and almost entirely unfriended through the world. When he discovers the secret of invisibility, he becomes the walking embodiment of the thought experiment – what would you DO if you suddenly had that power? Would any law still apply to you? The laws of the world? The laws of a societally-supposed common decency? Griffin, a man so often overlooked by the world, decides he can now free himself of all its constraints, and with the power to kill anyone, unobserved, he can rule – if not by legal means, then by fear, by tribute, by an understanding that his retribution will be terrible if he is disobeyed. It’s a conceit of Wells’ comical perversity that the Invisible Man is determined to be made visible by his actions. Here's the thing. When you have a central character as conflicted and complex as that, you need a very particular kind of actor to fill the role. You need someone who sees challenges as attractive to play, who flies towards conflict and complexity in the roles they choose, and who opens up the moral complexity inherent in every human being, and extra-specially present in those who have some reason to be separate from the throng. 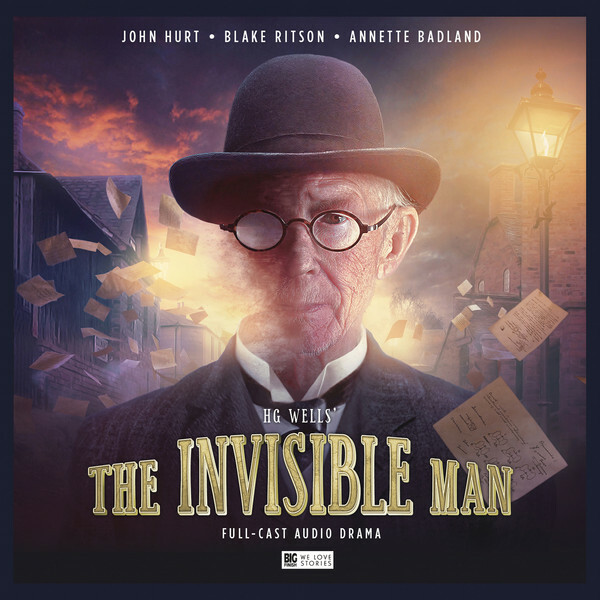 Yes – if you’re bringing The Invisible Man to the world in 2017, you need John Hurt. Of course, the world still badly needs the creative bravery of John Hurt, and as a man with many shades of fan-base, lots of people are still mourning the loss of the man, the actor, the spirit of play he embodied, and the breathtaking facility he brought to every kind of role, so hearing him as The Invisible Man now has a more bittersweet note than it would have had if Hurt were still here to count on for more roles and stories in the future. But what you need to know about Hurt as Griffin is that his version of the Invisible Man is definitive for a generation and probably for much, much longer. Hurt was so dependably magical, there’s every chance his version would have been definitive whatever was done to the story before he spoke a word of dialogue, but it would be wrong to make The Invisible Man a eulogy only to his talent. It’s an oddly spiky, comic tragedy, with strands of scientific supervillainy, the bones of which would later give comic-books decades of inspiration – the doomed, altered scientist, free of restraint. As such, there’s praise to spare for Jonathan Barnes, who dramatized this version, for script editor Matt Fitton, and for director Ken Bentley, who keeps it moving forward briskly, and with an almost Shakespearean spiral of degradation in Griffin’s state of mind. Big Finish’s version has an authority and authenticity in the telling, with some strong acting clout throughout the cast. If Griffin has an equal, it’s Kemp, a fellow scientist with whom he studied, and to whom he runs to explain his plans. Blake Ritson matches Hurt’s characteristic bravery with a simmering energy that bites down hard on the potential explosive reaction that comes with learning both of his colleague’s brilliance and of his increasing homicidal instability, until the very end of the story. Dan Starkey and Annette Badland, both stalwarts of TV and Big Finish Who, add believable local colour and texture to the start of the story, which, again highlighting Wells’ comic perversity, shows this unstable, overlooked genius checking in to rural inn in the Nowheresville of Iping, all nosey yokels and cheery disturbances in the life of a man who wants to be left alone to come to terms with what has happened to him, what he’s deliberately done to himself, and the eye-opening consequences of it. Peter Noble, as ‘gentleman of the road’ Thomas Marvel (another Wells irony, the lowest of men having a name that’s equivalent to ‘wonder’), gives the drama another note entirely, a more gravelly, down-to-earth and down-at-heel sound that pays tribute to Wells’ extraordinary capacity to see and report the truth of people to whom Victorian genteel society brought no benefit. This range of vocal talents, along with Alex Clatworthy as a handy trinity of innocent young women studded along Griffin’s degenerative path, helps paint with only a handful of actors a broad swathe of that society, and Griffin’s complex journey through it, the scientific genius hampered by the crushingly mundane lack of money, ascending through acts of increasing darkness from his social invisibility in the Victorian world to the wild power of public hysteria through the unpredictability of his attacks. But Hurt, in the middle of it all, is the figure to whose every intonation you can’t help but listen, most of all because, as he did throughout a lifetime of roles, he makes interesting choices. High-handed from the start, there are lines which could repay a straightforward, snappy delivery, but Hurt here makes them work much harder for their place in the story, giving them a sense of pleasantry through pain, as though Griffin remembers the burden of having to adhere to the social niceties and allow others to pry into his mysteries, even though he’s having to force himself to allow such incursions now he’s evolved into his new invisible state. His degeneration over time into a kind of darkly rational, ego-driven insanity is marked by the moments of his stillness as much as his Quixotic rages, and ultimately, Hurt makes Griffin what the best King Kong movies make the ape – someone whose presence can’t be tolerated for the safety of the public, but someone, too, whose monstrosity feels like a product of the society he’s in and how it treated him before he went ‘mad,’ driving him to an almost tormented frustration and a need for vengeance. The Invisible Man is one of Wells’ top three stories in terms of public recognition – The War of the Worlds and The Time Machine being the other two. This version is a phenomenal beginning to the Big Finish series of Wells adaptations, a richly textured and precisely constructed take on the tale of the Invisible Man, and as one of the last performances from an acting legend, it’s a definitive embodiment that deserves to stand the test of time, one more unusual, prickly, unique character in the legacy of a lifetime of brave choices and the talent to make that bravery sing.